Since 10-25% of all police calls involve an alarm activation, you can be assured that they will trigger in the event of a twilight break in. But what if you need daytime security solutions? When choosing between commercial security companies, make sure to ask about their advanced access control systems and solutions. If you value the safety of your inventory and want to overcome the risks involved with theft in your business, access control systems can give you the peace of mind you deserve. The ability to know who accessed a room and when they did so. Trust is important in any working relationship, but if you have highly sensitive information or assets in certain controlled areas, you will need to know who is entering, and when, regardless of how much you trust them. In high stakes situations, access control delivers auditable records. The ability to set different levels of clearance inter-departmentally. This goes perfectly with knowing who is entering which rooms. You might trust someone in one department with the information they have access to, but that doesn’t mean you should trust them with all information. Seamless security from potential external attackers. Does the external attacker have access to the room? No? Then they won’t get in. The best access control systems provide protection from internal and external threat alike. Choice. 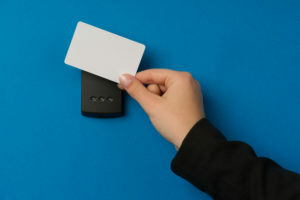 You can decide whether employees use key cards, a password, their fingerprint, a hand impression, a fob with person-specific data stored, or any number of other credentials that can authenticate them as the rightful entrant. Having an access control system can greatly improve the internal security of your workplace. It can also hold employees accountable for their daily responsibilities and can be customized to specific individuals to accomplish this. But, as great commercial security companies will tell you, you can never be too cautious. If you’re interested in upping your commercial security protocols, contact us today.